I usually keep a watch on eBay to see if any interesting items crop up relating to the Gant surname. 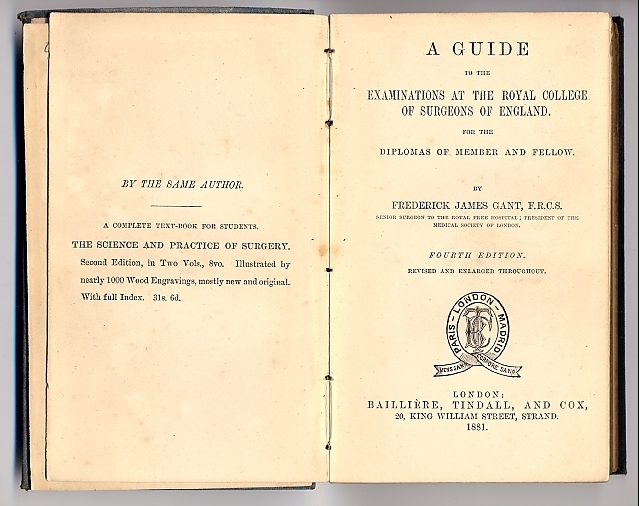 I recently found this little gem, a book by Frederick James Gant entitled “A Guide to the Examinations at the Royal College of Surgeons in England for the diplomas of Member and Fellow”. Of course I had to buy it! Frederick James Gant was a renowned surgeon born in Hackney, Middlesex in 1825, and author of many books on surgical procedures. The Gant Prize was founded at the Royal Free Hospital School of Medicine in 1907 by the Foundation of Frederick James Gant. Awarded jointly from 2004 following the merger of the Royal Free Hospital School of Medicine with University College London and Middlesex School of Medicine.